Rosemary is the common name for a woody, perennial herbaceous plant, Rosmarinus officinalis, characterized by fragrant, evergreen needle-like leaves and tiny, clustered, light blue, violet, pink, or white flowers. The name also refers specifically to the aromatic leaves of this plant, which are used as a herb for seasoning various dishes and used in perfumes. 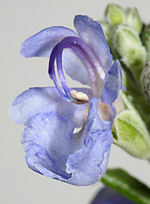 A member of the mint family, Lamiaceae, rosemary is native to the Mediterranean region. 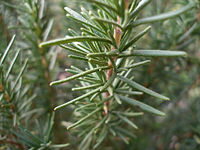 Rosemary is widely cultivated for culinary and medicinal use. It is used in a wide variety of dishes, including as a meat seasoning (lamb, poultry), to add flavor to soups and vegetables, and in fruit salads, dressings, and stuffings. As reflected by the name officinalis, it is known as a medicinal herb, with a long history of use in the West, including nervous system ailments. Queen Isabella of Hungary in the fourteenth century used rosemary to treat gout and rosemary has been burned in sick rooms as a disinfectant. Its aromatic properties are used to scent cosmetics. Known as "herb of remembrance," rosemary also has long been tied to legends and traditions. Pharaohs were buried with the herb in ancient Egypt, Greek scholars use rosemary to aid study, and young brides have traditionally carried a sprig of rosemary in wedding bouquets and wreaths. It has been exchanged as a symbol of loyalty between friends and tossed onto a loved one's grave. Ecologically, rosemary provides nectar and pollen to pollinating bees. There are a number of varieties of rosemary, Rosmarinus officinalis, ranging from upright to trailing forms. The upright varieties can reach 1.5 meters (4 feet, 11 inches) tall, rarely 2 meters (6 feet, 7 inches) in favorable settings. It has a deep taproot and stout, branching, scaly, stalks. The leaves are evergreen, simple, sessile, and opposite. They are narrow leaves, about 2 to 4 centimeters (0.79–1.6 inches) long and 2 to 5 millimeters (0.08-0.2 inches) broad. The leaves are dark green above and pale green on the underside, with a distinctive mid vein (Hanrahan and Frey 2005). They curl inward at the margins and have dense short woolly hair (Hanrahan and Frey 2005). The flowers appear in winter or spring and are variable in color, being white, pink, purple, or blue. They are tiny, two-lipped, and grow in a cluster of five to seven blossoms each from a pair of short, opposite spikes that alternate along the sides of the stalk (Hanrahan and Frey 2005). Two seeds are borne in each flower (Hanrahan and Frey 2005). The name rosemary has nothing to do with the rose or the name Mary, but derives from the Latin name ros marinus, which literally means "dew of the sea." The plant does grown wild on rocky, dry slopes near the sea (Hanrahan and Frey 2005). Other common names include polar plant, compass plant, and compass-weed (Hanrahan and Frey 2005). Rosemary grows wild in the Mediterranean area, where it is native. It is now cultivated throughout Europe and the United States (Herbst 2001), with France, Spain, and California the main producing areas. Rosemary thrives in sandy or chalky soil in full sun (Hanrahan and Frey 2005). It does not tolerate strong frosts, but does do well in most temperate areas. Since rosemary is attractive and tolerates some degree of drought, it is also used in landscaping, especially in areas having a Mediterranean climate. It is considered easy to grow for beginner gardeners, and is pest-resistant. Rosemary is easily pruned into shapes and has been used for topiary. When grown in pots, it is best kept trimmed to stop it getting straggly and unsightly, though when grown in a garden, rosemary can grow quite large and still be attractive. It can be propagated from an existing plant by clipping a shoot 10 to 15 centimeters (3.9–5.9 inches) long, stripping a few leaves from the bottom, and planting it directly into soil. Rosemary is cultivated for its aromatic and medicinal properties, and is widely used in perfumes and various dishes. The fresh and dried leaves of rosemary are used frequently in traditional Mediterranean cuisine as a herb. The leaves have a bitter, astringent taste, which complements a wide variety of foods. The herb can be obtained in whole-leaf form, fresh or dried, as well as in powdered form. A tisane can also be made from them. When burned they give off a distinct mustard smell, as well as a smell similar to that of burning which can be used to flavor foods while barbecuing. 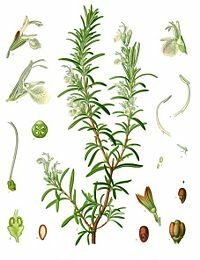 Among dishes where rosemary is used as a seasoning are soups, vegetables, meats such as lamb, fish and egg dishes, stuffings and dressings, and fruit salads (Herbst 2001). Rosemary is extremely high in iron, calcium, and Vitamin B6 (ND 2008). Rosemary has been used medicinal for long time. Hungary water, an alcohol-based perfume involving distilled fresh rosemary, was traditionally believed to have been first prepared for the Queen of Hungary in the fourteenth century to "renovate vitality of paralyzed limbs" and to treat gout. 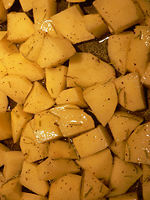 It was used externally and prepared by mixing fresh rosemary tops into spirits of wine or brandy. It has been used to ward off the plague and burned in sick rooms as a disinfectant. Long used medicinally in the West, and called a "sovereign balm' by seventeenth-century herbalist Nicholas Culpeper, it has been used as a circulatory stimulant (treatment of blood pressure problems), antibacterial and antifungal oil, digestive stimulant, liver tonic, reduction of excessive menstrual flow, and is said to have cancer-inhibiting effects ((Hanrahan and Frey 2005). Rosemary has a very old reputation for improving memory, and has been used as a symbol for remembrance (during weddings, war commemorations, and funerals) in Europe. Mourners would throw it into graves as a symbol of remembrance for the dead. Greek scholars would wear some of the pungent herb in their hair during study to increase concentration (Hanrahan and Frey 2005). In Shakespeare's Hamlet, Ophelia says, "There's rosemary, that's for remembrance." (Hamlet, iv. 5.) One modern study lends some credence to this reputation. When the smell of rosemary was pumped into cubicles where people were working, those people showed improved memory, though with slower recall (Moss et al. 2003). Rosemary contains a number of potentially biologically active compounds, including antioxidants such as carnosic acid and rosmarinic acid. Other bioactive compounds include caffeic acid, ursolic acid, betulinic acid, rosmaridiphenol, and rosmanol. The results of a study suggest that carnosic acid, found in rosemary, may shield the brain from free radicals, lowering the risk of strokes and neurodegenerative diseases like Alzheimer's and Lou Gehrig's (BIMR 2007). Rosemary in culinary or therapeutic doses is generally safe; however, precaution is necessary for those displaying allergic reaction or prone to epileptic seizures. Rosemary essential oil may have epileptogenic properties, as a handful of case reports over the past century have linked its use with seizures in otherwise healthy adults or children (Burkhard et al. 1999). Rosemary essential oil is potentially toxic if ingested. Large quantities of rosemary leaves can cause adverse reactions, such as coma, spasm, vomiting, and pulmonary edema (fluid in the lungs) that can be fatal. One should avoid consuming large quantities of rosemary if pregnant or breastfeeding, although small quantities to season foods are considered safe (Hanrahan and Frey 2005). Burkhard, P. R., K. Burkhardt, C.-A. Haenggeli, and T. Landis. 1999. Plant-induced seizures: reappearance of an old problem. Journal of Neurology 246(8): 667–670. PMID 10460442. Retrieved January 1, 2009. Burnham Institute for Medical Research (BIMR). 2007. Rosemary chicken protects your brain from free radicals. ScienceDaily November 2, 2007. Retrieved January 1, 2009. Calabrese, V., G. Scapagnini, C. Catalano, F. Dinotta, D. Geraci, and P. Morganti. 2000. Biochemical studies of a natural antioxidant isolated from rosemary and its application in cosmetic dermatology. International Journal of Tissue Reactions 22(1): 5–13. PMID 10937349. Retrieved January 1, 2009. Hanrahan, C. and R. J. Frey. 2005. Rosemary. In J. L. Longe, ed. The Gale Encyclopedia of Alternative Medicine. Farmington Hills, MI: Thomson/Gale. ISBN 0787693960. Huang, M. T., C.-T. Ho, Z. Y. Wang, et al. 1994. Inhibition of skin tumorigenesis by rosemary and its constituents carnosol and ursolic acid. Cancer Research 54(3): 701–708. PMID 8306331. Retrieved January 1, 2009. Moss, M., J. Cook, K. Wesnes, and P. Ducket. 2003. Aromas of rosemary and lavender essential oils differentially affect cognition and mood in healthy adults. International Journal of Neuroscience 113(1): 15–38. Retrieved January 1, 2009. Nutrition Data (ND). 2008. Spices, rosemary, dried. Nutrition Data. Retrieved January 1, 2009. This page was last modified on 19 July 2015, at 19:23.